Doublecortin in vitro SimpleStep ELISA® (Enzyme-Linked Immunosorbent Assay) kit is designed for the quantitative measurement of Doublecortin protein in human cell and tissue extract samples. Doublecortin is a microtubule-associated protein required for initial steps of neuronal dispersion and cortex lamination during cerebral cortex development. It may act by competing with the putative neuronal protein kinase DCLK1 in binding to a target protein. Doublecortin may in that way participate in a signaling pathway that is crucial for neuronal interaction before and during migration, possibly as part of a calcium ion-dependent signal transduction pathway. Doublecortin may be part with PAFAH1B1/LIS-1 of overlapping, but distinct, signaling pathways that promote neuronal migration. Doublecortin interacts with tubulin and USP9X. Mutations affecting the Doublecortin gene are causing X-linked 1 Lissencephaly, a disease characterized by mental retardation and seizures that are more severe in male patients. Female patients display a less severe phenotype referred to as 'doublecortex'. Doublecortin is highly expressed in neuronal cells of fetal brain (in the majority of cells of the cortical plate, intermediate zone and ventricular zone), but not expressed in other fetal tissues. In the adult, it is highly expressed in the brain frontal lobe, but it has very low expression in other regions of brain, and it is not detected in heart, placenta, lung, liver, skeletal muscles, kidney and pancreas. Our Abpromise guarantee covers the use of ab218267 in the following tested applications. Interpolated concentrations of native Doublecortin in SH-SY5Y cell extract, human fetal brain tissue extract and rat brain tissue extract. 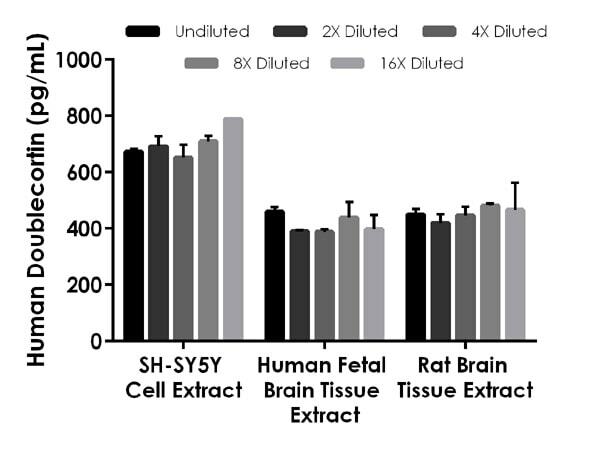 Interpolated concentrations of native Doublecortin in SH-SY5Y cell extract samples based on a 100 µg/mL extract load, human fetal brain tissue extract samples based on a 300 µg/mL extract load, and rat brain tissue extract samples based on a 500 µg/mL extract load. The concentrations of Doublecortin were measured in duplicate and interpolated from the Doublecortin standard curve and corrected for sample dilution. The interpolated dilution factor corrected values are plotted (mean +/- SD, n=2). The mean Doublecortin concentration was determined to be 703 pg/mL in SH-SY5Y cell extract samples, 415 pg/mL in human fetal brain tissue extract samples, and 535 pg/mL in rat brain tissue extract samples. Doublecortin is highly expressed in neuronal cells of the fetal brain. 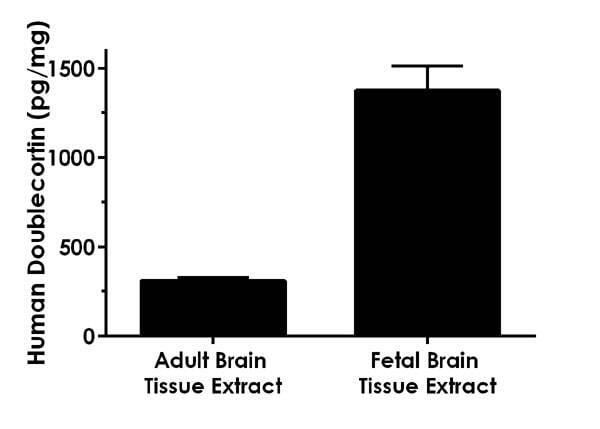 Human adult brain tissue extract and human fetal brain tissue extract samples were analyzed based on a 300 µg/mL extract load. The concentrations of Doublecortin were measured in duplicate and interpolated from the Doublecortin standard curve and corrected for sample dilution. The interpolated dilution factor corrected values are plotted in pg Doublecortin per mg of extract (mean +/- SD, n=3). The mean Doublecortin concentration was determined to be 309 pg/mg in human adult brain tissue extract samples, and 1375 pg/mg in human fetal brain tissue extract samples. 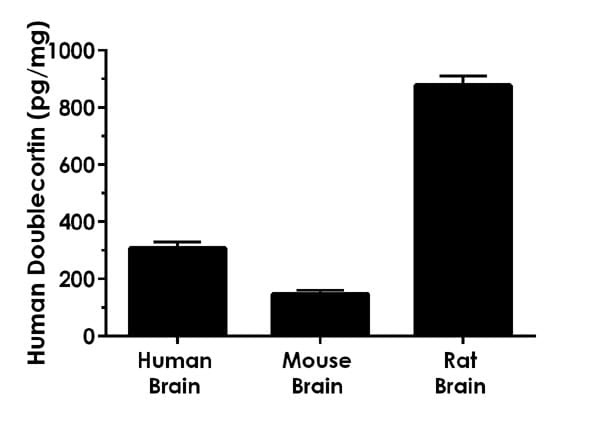 Other species reactivity was determined by measuring various species adult brain tissue extract samples. 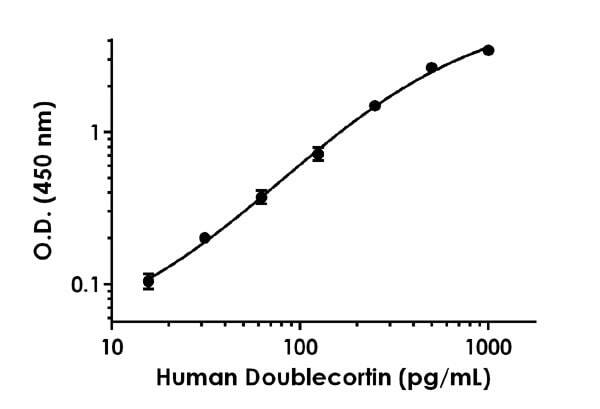 The concentrations of Doublecortin were measured in duplicate and interpolated from the Doublecortin standard curve and corrected for sample dilution. The interpolated dilution factor corrected values are plotted in pg Doublecortin per mg of extract (mean +/- SD, n=3). The mean Doublecortin concentration was determined to be 309 pg/mg in human adult brain tissue extract samples, 147 pg/mg in mouse brain tissue extract samples, and 878 pg/mg in rat brain tissue extract samples. ab218267 has not yet been referenced specifically in any publications. Publishing research using ab218267? Please let us know so that we can cite the reference in this datasheet. There are currently no Customer reviews or Questions for ab218267.